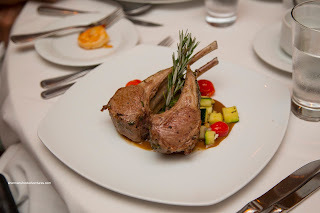 As much as the food on my previous NCL experience was akin to a cafeteria food, one meal did stand out. 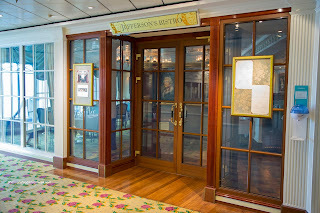 That was our specialty dinner at Le Bistro in the old Norwegian Star. It may have possibly been attributed to the fact it was our anniversary meal, but in general, it was on point. 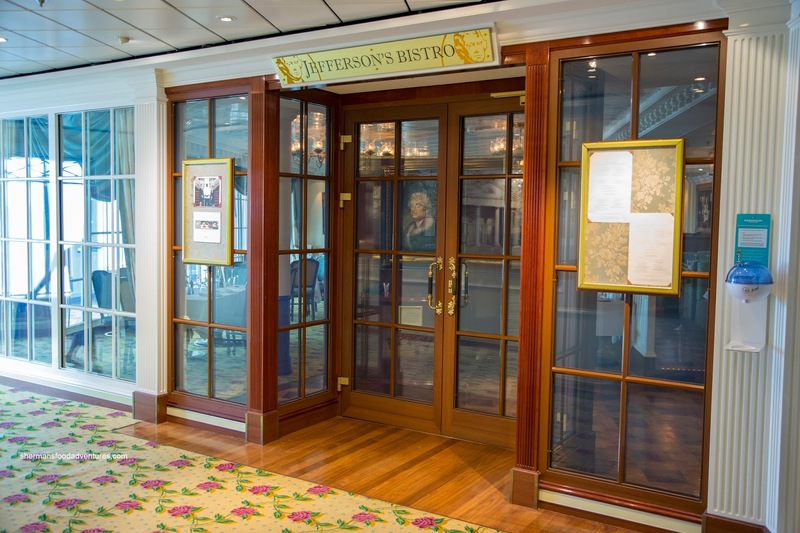 So with those expectations, we headed over to Jefferson’s Bistro for our 2nd French food encounter on NCL 12 years later. For my appies, I began with the Les Quatre Corents featuring 4 savory cones filled with salad Provencal, duck confit, pear, blue cheese & walnut medley and smoked chicken salad. For me, this looked better than it ate. 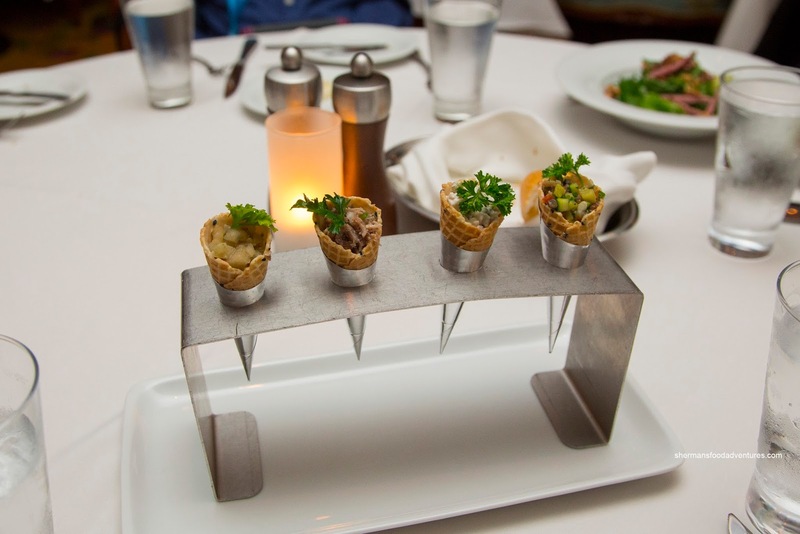 I thought the firm cones took away from the ingredients and the only one that stood on its own was the smoky and creamy chicken salad. I also had the Soupe aux Quatre Champignons made with 4 types of mushrooms. Hence, the soup was definitely woodsy and full-bodied. I liked how it wasn’t reliant on salt as well as the thick, creamy consistency. Viv went for the Coquilles St. Jacques Provencal consisting of 3 seared scallops atop eggplant, tomato, pine nuts and olive oil. 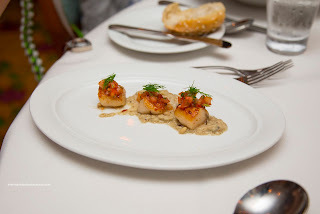 As much as the scallops were pretty tiny, they were prepared more or less properly being buttery and soft. 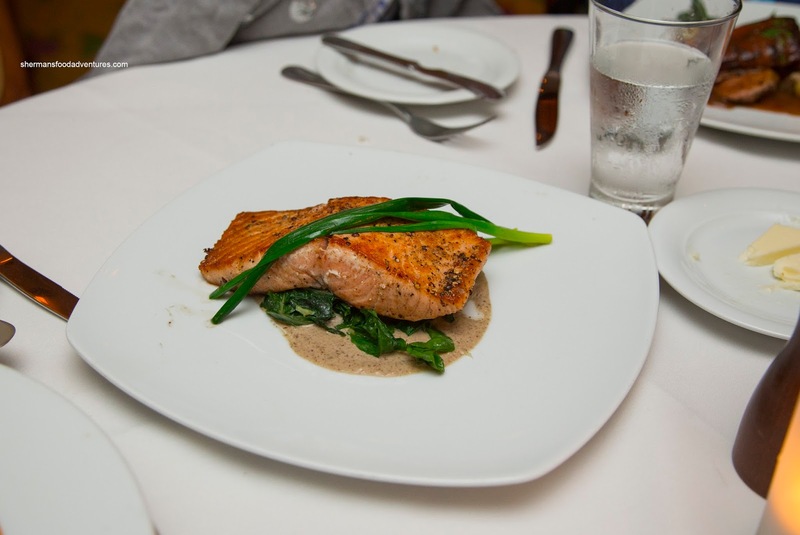 We thought the sear was pretty consistent. Underneath them, the puree was definitely eggplant in flavour and texture. 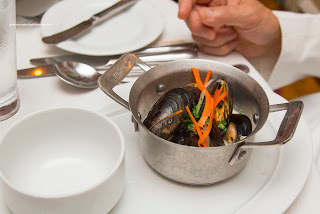 My dad had the Moules Poulette au Pernod with parsley and cream. The smallish portion sported buttery mussels in a very mild and slightly creamy broth. We felt there could've been more acidity and wine essence. My mom wanted to try the Salade Gourmande because of the smoked duck. Yup, she ate all the duck and left the frisee, endive and walnuts in a champagne vinaigrette for my dad. It’s exactly what she does with pizza, eating only the toppings... (my daughter does that too, I wonder where she gets it from...). The duck was indeed smoky while sufficiently tender. 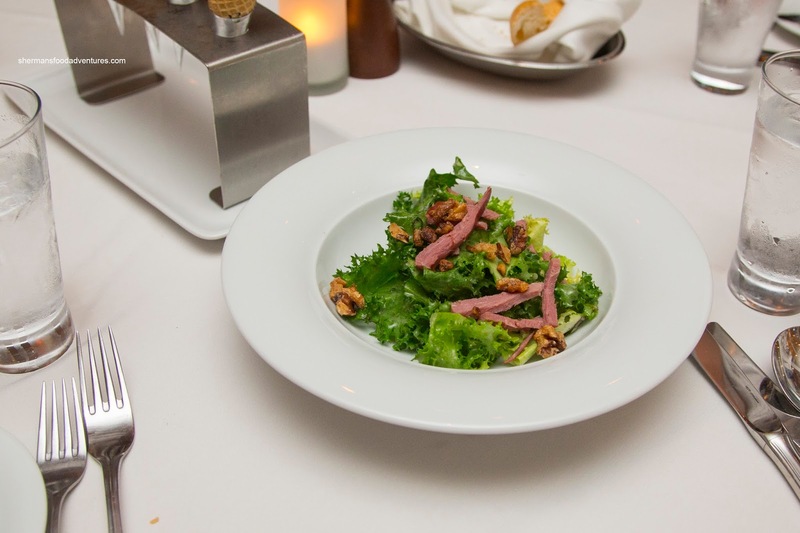 We felt the vinaigrette exhibited a nice acidity. We also shared the Escargot Bourguignonne with classic garlic herb butter. 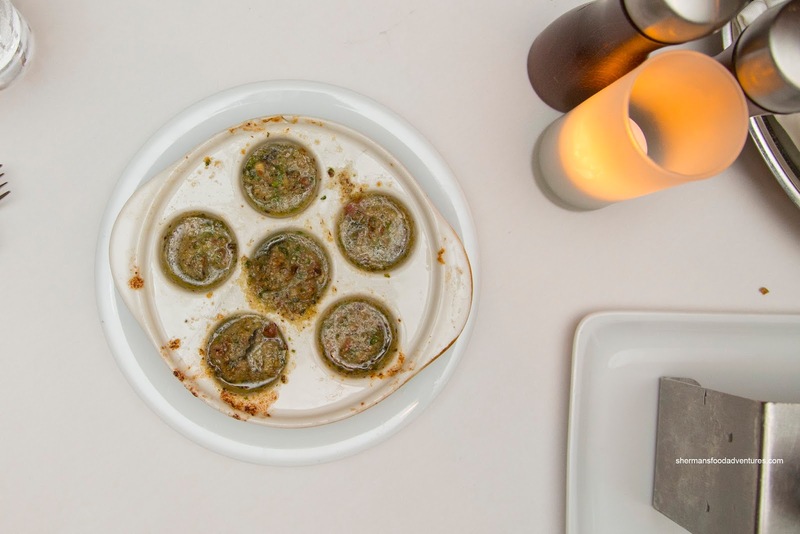 Normally, this dish can be pretty salty, but it wasn’t the case here as the soft escargots were bathed in a tasty butter. 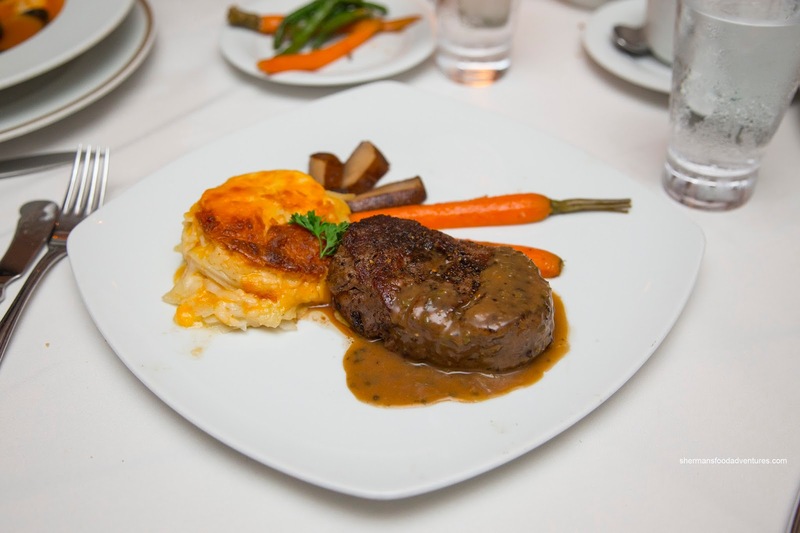 For my main, I had the Filet de Boeuf Grille consisting of grilled beef tenderloin, Portobello mushrooms, Roquefort cheese potato gratin and green peppercorn sauce. Although the tenderloin was rare (I asked for medium-rare), the steak was so buttery soft, it didn’t matter. I thought the peppercorn sauce was balanced and impactful while the gratin was terrible (being severely underdone and crunchy). The theme of underdone was definitely in play with my mom’s Carre D’Agneau Rotis where the rack of lamb was quite rare (she asked for M/R). Although it was seasoned well, she had to send it back because it was just not cooked enough. 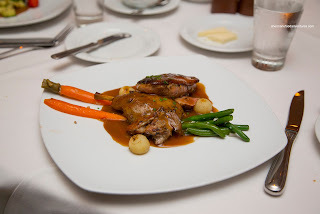 Her replacement dish (which my son had as well) was the Duo de Canard featuring seared breast of duck and duck confit, Parisienne potatoes, French beans and Madeira sauce. The duck confit leg portion of the dish was on point being fork tender and moist. 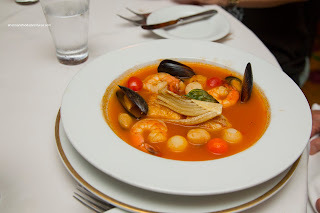 Bathed in the flavourful, yet slightly salty Madeira sauce, even my son ate it willingly. However, the duck breast fat was not rendered enough while the meat was on the chewier side. My daughter’s Filet de Saumon D’Atlantic was also underdone, but in a good way since it was salmon. Hence, it was flaky and still buttery moist inside. 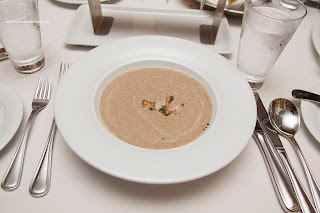 Interestingly, the morel mushroom cream sauce was very similar to the soup. That was actually a good thing as it was super flavourful and Earthy. Possibly the best dish of the meal was the Bouillabaisse featuring scallops, shrimp and snapper in a tomato, saffron and pernod broth. All the proteins were prepared expertly where the scallops were buttery, the shrimp with a rebound and snapper was moist and flaky. They all sat in a light broth that was spiked with enough saffron and was easy on the salt. 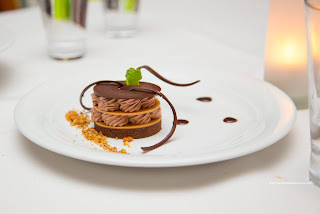 For dessert, I had the Chocolate Napoleon constructed of flourless chocolate cake, hazelnut crunch and Gianduja cream. Attractively plated, the dessert was a bit clumsy to eat where the layers did not want to cooperate with each other. However, it was chocolaty without being super sugary. 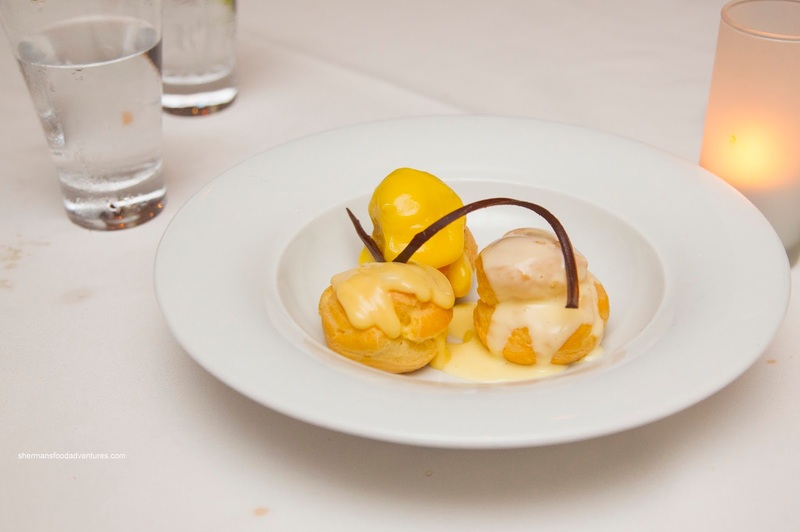 Even lower on the sweetness scale was the Caramel, Vanilla and Lemon Profiteroles. Despite being a bit dry, the profiteroles were topped with enough sauce to moisten things up. Nothing was particularly sweet and in fact, the lemon was rather tart. 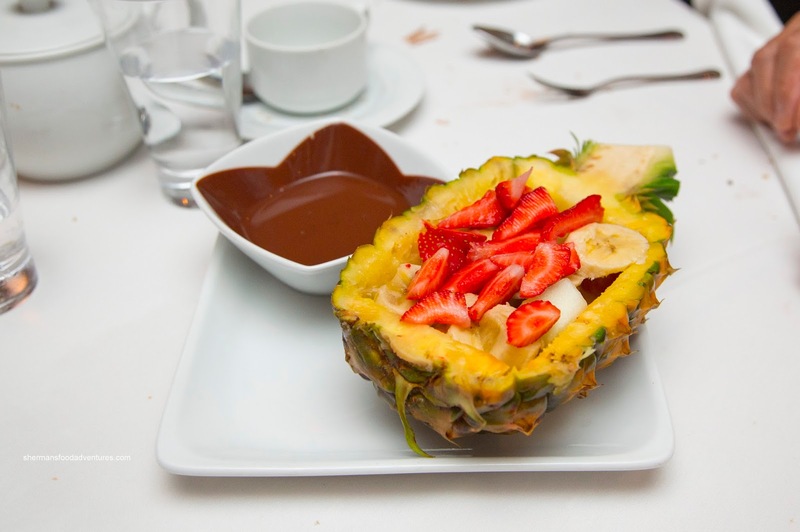 My dad opted for the Chocolate Fondue with pineapple, strawberries and banana accompanied by a liquid chocolate dip. Nothing particularly interesting about the fruit other than being cut up into bite-sized portions. The silky chocolate fondue was mildly sweet with some bitterness. My mom went for her standby being the Vanilla Creme Brulee with berry basket and sable cookie. 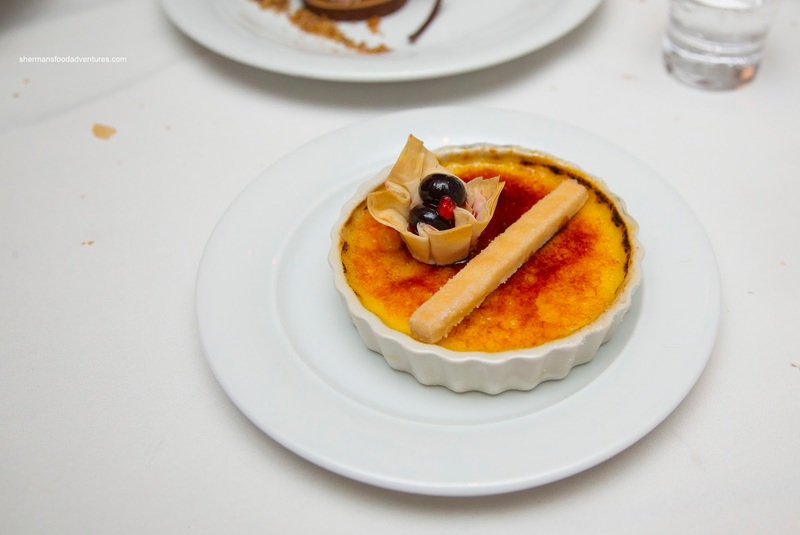 This was a pretty textbook version with somewhat thick custard that was easy on the sugar which meant the torched sugar topping was necessary.